Professor Richard K. Emmerson, the chairman of the Department of Art History at The Florida State University and an internationally renowned scholar on the Middle Ages, has garnered the 2009 Excellence in Teaching Medieval Studies award from the Medieval Academy of America. Worldwide, only one recipient of the distinguished honor is named each year by the Academy, which is the largest professional organization in the world devoted to medieval studies. About a third of its members are from outside the United States. This is the first time that a Florida State faculty member has won the Excellence in Teaching award. "It is a great honor on an international scale not only for Professor Emmerson but also for our university and its College of Visual Arts, Theatre and Dance," said Sally McRorie, dean of the college. "It is noteworthy that Emmerson was nominated by no fewer than three of our graduate students in art history, and that additional letters of support came from among the foremost scholars and teachers in the field of medieval studies." Emmerson, who also holds a courtesy faculty position in the Department of English, is the former executive director of the Medieval Academy of America. In the three decades since earning his Ph.D. at Stanford University, he taught at Georgetown University, Harvard University, Tufts University and Western Washington University (where he chaired the Department of English) prior to joining FSU´s faculty in 2006. His acclaimed interdisciplinary research has focused on apocalyptic themes in medieval art, drama and poetry and on illustrated manuscripts, primarily from England and France, from the 13th through 15th centuries. 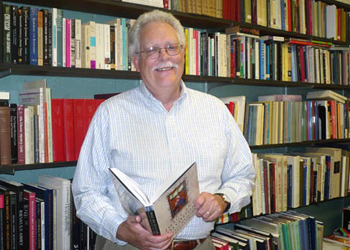 "As a widely recognized medieval scholar, Emmerson has helped to enhance significantly the national reputation of Florida State´s art history department," McRorie said. "Moreover, the acknowledgment from scholarly peers worldwide of his great passion for teaching is a marvelous addition to his academic credentials. Sometimes scholars can become so immersed in their research and administrative and other leadership duties that they may become less directly dedicated to students and great teaching. But Rick clearly has maintained a strong and effective dedication to all aspects of his role, from teaching to research and service." In 2008, Emmerson was the keynote speaker to more than 3,000 scholars at the 44th meeting of the International Congress of Medieval Studies. In 2007, the Council of Editors of Learned Journals named Emmerson "Distinguished Editor" for his work editing Speculum: A Journal of Medieval Studies from 1999 to 2006. He has served as the deputy director of Fellowships at the National Endowment for the Humanities, and is the incoming president of the Medieval and Renaissance Drama Society. Emmerson has written nearly 40 articles and essays that have appeared in academic journals and scholarly collections and, so far, had six books published, including his first (1981) and best-known book, Antichrist in the Middle Ages: A Study of Medieval Apocalypticism, Art, and Drama. He now has been contracted as the editor of the new Dictionary of Medieval Civilization that is slated for publication in three or four years by Cambridge University Press. The huge reference work will involve about 175 scholars and 1,300 pages of text. "Professionally, this teaching award means a lot to me because when I came to FSU in 2006 to chair the Department of Art History I switched disciplinary fields," Emmerson said. "My Ph.D. is in English, and in the past I have chaired an English department, so it is especially gratifying to be recognized in my new discipline. This honor means a great deal to me personally because the graduate students who nominated me, on their own and in confidence, invested the substantial time necessary to create the nomination file." "The Department of Art History at Florida State is very lucky to have excellent students in our graduate program, many of whom concentrate on medieval art history," Emmerson said. "This facilitates excellent seminars and mutual support among students and thus makes our program in this area one of the very best in the nation."